Broadgate never remains static whatever the era. Pedestrianised Broadgate inCoventryis now a large piazza bursting with fun-packed family activities. Since last October, buses and taxies were banned fromCoventry’s Broadgate area. The £7 million project was aimed at transforming the city ahead of this year’s Olympics. Following the enormous transformation, more trees have been planted in Broadgate and the area is now a traffic-free zone. An event space needed in the city centre has finally been provided due to the transformation. However, the current effective and dynamic use of Broadgate has overshadowed criticisms that the transformation will lead to a loss of business. Hundreds have headed to the Beach in the city centre and visited ‘Coventry-on-Sea’ this week. It is free to visit with lots entertainment for kids, including rides around the city centre on the land train, children’s tea cup ride, BBQ stall, ice cream and rock stall, face painting, candy floss and many more. There are free goodies and prizes to be won each day, including a chance to win a home garden gas BBQ worth £500.00. Next week Broadgate will again be alive with entertainment as the Coventry Mysteries Week arts festival brings in performers from across theUK. ‘Container’, a dance piece in a shipping container will be an intriguing addition on Monday and Tuesday. On Wednesday, ‘The Whale’ will come ashore and is a gentle giant made of metal which swallows audience one or two at a time for an unforgettable three minutes theatre performance. It is suitable for children above the ages of six years. A three minute adventure in the belly of the whale might see audience leave with a gift from the sea. Entering the jaws of the giant silver whale promises audience being serenaded by a lovesick submariner. ‘The Midsommer Mechanicals and their Amazing Carnival of Animals’ will be in town from Thursday the 14th to Saturday the 16th of June. The performers taking to the streets of Coventry for three days with their traditional pageant wagon and members of the public will see a myriad of colourful characters roaming the streets with short plays, music and circus skills. 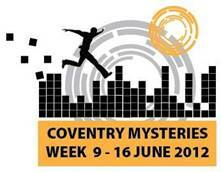 For more information about the festival, visit the website www.coventrymysteries.com or pick up a brochure from cafes, museums and Tourist Information.